Generalfeldmarschall Erwin Rommel in 1942. Erwin Johannes Eugen Rommel (November 15, 1891 – October 14, 1944) was one of the most distinguished field marshals of World War II. He was the commander of the Deutsches Afrika Korps and became known by the nickname “The Desert Fox” for his brilliant leadership during the tank battles he waged on behalf of the German Army in North Africa. He was later in command of the German forces opposing the Allied cross-channel invasion at Normandy. Rommel is remembered not only for his remarkable military prowess, but also for his reputation for chivalry towards his adversaries. He was one of the few German commanders who disobeyed Adolf Hitler's infamous 1942 Commando Order requiring that allied commandos captured in Europe and Africa be immediately executed even if they attempted to surrender. He is also noted for being regarded by the initiators of the July 20 Plot as someone to be trusted following the plan to assassinate Hitler in 1944, although Rommel was not a participant in the plot. The esteem the organizers of the plot had for Rommel may have played a large role in his fate. Faced with being implicated, Rommel took the offered choice of suicide and sacrificed his own life rather than see the execution of his family as well as himself following what was certain to be a show trial. Among the former Allies, Rommel developed a reputation after his death as a noble soldier who happened to fight on the wrong side. Erwin Rommel was born in Heidenheim, Germany, approximately 27 miles from Ulm, in the state of Württemberg. He was baptized on November 17, 1891. He was the second son of a Protestant headmaster of the secondary school at Aalen, also named Erwin Rommel, and Helene von Luz, a daughter of a prominent local dignitary. The couple had three more children, two sons, Karl and Gerhard, and a daughter, Helene. At the age of 14, Rommel and a friend built a full-scale glider that was able to fly, although not very far. Young Erwin considered becoming an aeronautical engineer and would throughout his life display extraordinary technical aptitude. However, at his father's insistence, he joined the local 124th Württemberg Infantry Regiment as an officer cadet in 1910 and, shortly after, was sent to the Officer Cadet School in Danzig. 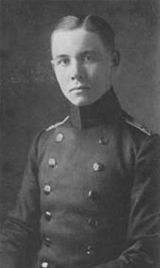 A young Rommel as an officer cadet around 1910. While at Cadet School early in 1911, Rommel met his future wife, 17-year-old Lucia Maria Mollin (commonly called "Lucie"). He graduated in November 1911, and was commissioned as a lieutenant in January 1912. Rommel and Lucie married in 1916, and in 1928 they had a son, Manfred, who would later become the mayor of Stuttgart. During World War I, Rommel fought in France, as well as in Romania and Italy as part of the élite Alpen Korps. While serving with that unit, he gained a reputation for making quick tactical decisions and taking advantage of enemy confusion. He was wounded three times and awarded the Iron Cross, First and Second Class. Rommel also received Prussia's highest medal, the Pour le Mérite—an honor traditionally reserved for generals—after fighting in the mountains of west Slovenia in the Battle of the Isonzo. The award came as a result of the capture of Mount Matajur, Slovenia, and its defenders, numbering 150 Italian officers, 7,000 men, and 81 pieces of artillery. Rommel's battalion also played a key role in the decisive victory of the Central Powers over the Italian Army at the Battle of Caporetto. After the war, Rommel held battalion commands and was an instructor at the Dresden Infantry School from 1929 to 1933, and the Potsdam War Academy from 1935 to 1938. Rommel's war diaries, Infantry Attacks, published in 1937, became a highly regarded military textbook and attracted the attention of Adolf Hitler, who placed him in charge of the War Ministry liaison with the Hitler Youth’s Headquarters of Military Sports. This was the Hitler Youth branch involved with paramilitary activities: Terrain exercises and marksmanship. Rommel applied himself energetically to the new task. In 1937, Rommel conducted a tour of Hitler Youth (HJ) meetings and encampments, and delivered lectures on German soldiering while inspecting facilities and exercises. Simultaneously, he was pressuring Hitler Youth leader Baldur von Schirach, to accept an agreement expanding the army's involvement in Hitler Youth training. Schirach interpreted this as a bid to turn the Hitler Jugend into an army auxiliary, a "junior army" in his words. He refused, and Rommel, whom he had come to dislike personally, was denied access to the Hitler Jugend. An agreement between the Army and the Hitler Youth was concluded, but on a far more limited scope than Rommel had sought. Cooperation was restricted to the army providing personnel to the Rifle School, much to the army's chagrin. By 1939, the Hitler Jugend had 20,000 rifle instructors. Rommel retained his place at Potsdam and was awarded the highest war ribbons for excellent performance. In 1938, Rommel, now a colonel, was appointed commandant of the War Academy at Wiener Neustadt. Here he started his follow-up to Infantry Attacks, Panzer greift an (Tank Attacks). However, Rommel was soon removed to take command of Adolf Hitler's personal protection battalion (FührerBegleitbataillon), assigned to protect him in the special railway train used during his visits to occupied Czechoslovakia and Memel. It was at this period that he met and befriended Joseph Göbbels, the Reich's minister of propaganda. Goebbels became a fervent admirer of Rommel, and later ensured that Rommel's exploits were celebrated in the media. Rommel continued as Führerbegleitbataillon commander during the Polish campaign, often moving up close to the front and seeing much of Hitler. After the Polish defeat, Rommel returned to Berlin to organize the Führer's victory parade, taking part himself as a member of Hitler's entourage. Rommel asked Hitler for command of a panzer division and, on February 6, 1940, only three months before the invasion, Rommel was given command of the German 7th Panzer Division for "Case Yellow," the invasion of France and the Low Countries. This string-pulling provoked resentment among fellow officers, the more so as Rommel had no experience with armor. Nevertheless, he showed considerable skill in this operation, repulsing a counterattack by the British Expeditionary Force at Arras. Rommel also set the record for the longest thrust in one day by Panzers up to that point, covering nearly 150 miles. The 7th Panzer Division was one of the first German units to reach the English Channel (on June 10) and captured the vital port of Cherbourg on June 19. However, Rommel has also been criticized for misappropriating supplies and bridging equipment belonging to the neighboring divisions, gravely hampering their operations. His commander, Hermann Hoth, considered court-martialing him for this, but was dissuaded by his own commander, Hans von Kluge. The fame gained by Rommel during the campaign made a court-martial, or even a reprimand, impractical. Rommel's reward for his success was to be promoted and appointed commander of the German 5th Light Division and the 15th Panzer Division, which were sent to Libya in early 1941, to aid the hapless and demoralized Italian troops, forming the Deutsches Afrika Korps. 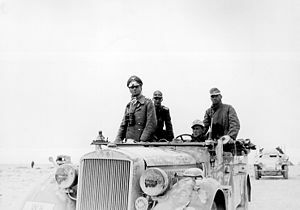 Rommel with the 15th Panzer Division near Tobruk. The campaign in Africa earned Rommel the nickname “The Desert Fox.” He spent most of 1941 building up his forces, the Italian component of which had suffered a string of defeats at the hands of British Commonwealth forces under Major-General Richard O’Connor. An offensive pushed the Allied forces out of Libya. Though ordered not to advance beyond the oasis of Maradah, Rommel disobeyed and was shortly stalled exactly on the Egyptian border at Helfaya pass. He then ordered the important port of Tobruk to be outflanked, hoping thus to trap the bulk of the enemy force entrenched there. This outflanking maneuver could not be carried out as rapidly as was necessary due to logistical overstretch. Before long, a sandstorm further complicated the advance. Although surrounded, Tobruk remained under the control of Allied forces under the Australian General, Leslie Morshead. The unsuccessful assault on Tobruk, whose capture was logistically imperative, was a failure that imperiled Rommel's career. Impatient to secure success, Rommel ordered repeated small-scale attacks which were easily repulsed by the defenders. Before long, his logistically strapped forces became so weak that a break-out from Tobruk could most likely have reached El Adem, sever the Afrika Korps’s communications, and topple it. Morshead was misled by intelligence overestimates of the German forces opposing Tobruk, and thus Rommel was saved. At this time, Rommel strongly requested reinforcements that the High Command believed it could not spare. 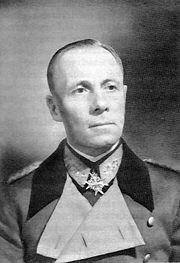 Army Chief of the General Staff Franz Halder, angry that his order not to advance beyond Maradah had been disobeyed and alarmed at mounting losses, dispatched Friedrich Paulus to "head off this soldier gone stark mad." Upon arrival Paulus forbade Rommel from undertaking any more small-scale assaults, but to plan a systematic, all-out attack. His composure restored, Rommel complied. His planned major assault scheduled for November 21, however, was not to take place. British Commander-in-Chief of India, General Claude Auchinleck had now been assigned to the task of relieving Tobruk and launched a major offensive to that end—Operation Crusader. Initially Crusader appeared doomed. The British had deeply outflanked the German defenses along the Egyptian frontier with a long left hook through the desert and reached a position where they could strike at both Tobruk and the coastal road, "Via Balbia." The British planned for the Germans to counter-attack so as to drive the British back. This, as a result of British numerical superiority in both planes and tanks, would result in the Germans' annihilation. The Germans, however, were confident in the strength of the defenses covering the Via Balbia and stayed put, waiting on the Allies’ next move. The baffled British, whose plan did not provide for this eventuality, felt compelled to attack and try to relieve Tobruk, severing the Via Balbia. However, neglecting to bring the necessary heavy artillery among other tactical errors, they suffered heavy loses and failed in their objective. Rommel then over-exploited his success by attempting to drive the British further back than their start line and outflank them as well. Rommel's contempt for the enemy proved excessive and the gamble failed. His forces suffered major losses from British antitank guns and, as they dispersed over the desert from Royal Air Force planes. Unlike the British, Rommel could not replace his losses and his forces were soon unable even to hold their initial positions. During the confusion caused by the Crusader operation, Rommel and his staff found themselves behind Allied lines several times. Crusader was thus another defeat for Rommel. After several weeks of fighting, he ordered the withdrawal of all his forces from the area around Tobruk on December 7, 1941. The Allies followed, attempting to cut off the retreating troops, but Rommel's counterattack on January 20, 1942, mauled the Allied forces. The Allies pulled back to the Tobruk area and commenced building defensive positions. On May 26, 1942, Rommel's army again attacked. In a classic Blitzkrieg, he outflanked the Allies at Gazala, surrounded and reduced the strong point at Bir Hakeim, and forced the Allies to quickly retreat in order to avoid being completely cut off. Tobruk, isolated and alone, was now all that stood between the Afrika Korps and Egypt. On June 21, 1942, after a swift, coordinated and fierce combined arms assault, the city surrendered along with its 33,000 defenders. Although the able troops who had defended Tobruk in 1941 had been dispatched to the Pacific at the insistence of the Australian Government, only at the fall of Singapore, earlier that year, had more British Commonwealth troops been captured. Hitler made Rommel a field marshal. Within weeks, the Allies were pushed back far into Egypt. Romel with his aides, 1942. Rommel's 21.Panzer-Division was eventually stopped at the small railway town of El Alamein, just sixty miles from Alexandria. With Allied forces from Malta intercepting his supplies at sea and the enormous distances supplies had to travel to reach his forward troops, Rommel could not hold the El Alamein position forever. Still, it took a large, set-piece battle, the Second Battle of El Alamein, to dislodge his forces. Rommel had taken sick leave in Italy and Germany, but immediately returned when news of the battle reached him. After the defeat at El Alamein, Rommel's forces managed to escape by using all the Italian transports. 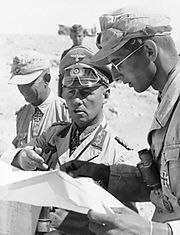 Despite urgings from Hitler and Mussolini, Rommel's forces did not again stand and fight until they had entered Tunisia. Even then, their first battle was not against the British Eighth Army, but against the U.S. II Corps. Rommel inflicted a sharp defeat on the American forces at the Battle of the Kasserine Pass. Turning once again to face the British Commonwealth forces in the old French border defenses of the Mareth Line, Rommel could only delay the inevitable. At the end of January 1943, the Italian General Giovanni Messe was appointed the new commander of Rommel’s Panzer Army Africa, which was now renamed the 1st Italo-German Panzer Army. Though Messe was to replace Rommel, he diplomatically deferred to the German, and the two coexisted in what was theoretically the same command until March 9, when Rommel finally departed Africa. Rommel's departure was kept secret on Hitler's explicit orders, so that the morale of the Axis troops, as well as the respectful fear of their enemies, could be maintained. The last Rommel offensive in North Africa occurred on March 6 1943, when he attacked General Bernard Montgomery’s Eighth Army at the Battle of Medenine with three Panzer divisions. Decoded intercepts allowed Montgomery to deploy large numbers of anti-tank guns in the path of the offensive. After losing 52 tanks, Rommel was forced to call off the assault. On March 9, he handed over command of his forces to General Hans-Jürgen von Arnim and left Africa because of health reasons, never to return. On May 13, 1943, after the collapse of the German 5th Army, the fall of Tunis, and the surrounding of the Italian 1st Army, General Messe formally surrendered to the Allies. Back in Germany, Rommel was for some time virtually "unemployed." On July 23, 1943, he moved to Greece as commander of Army Group E to defend the Greek coast against a possible allied landing that never happened, only to return to Germany two days later upon the overthrow of Mussolini. On August 17, 1943, Rommel moved his headquarters from Munich to Lake Garda as commander of a new Army Group B, created to defend the north of Italy. 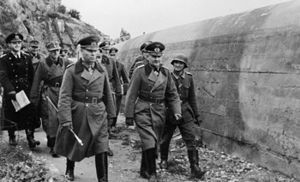 Rommel inspects defenses along the Atlantic Wall during the spring of 1944. 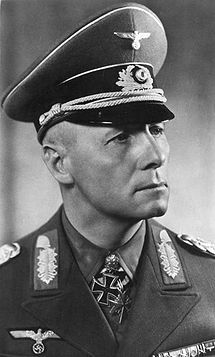 After Hitler gave General Albert Kesselring sole Italian command on November 21, Rommel moved Army Group B to Normandy, France, with responsibility for defending the French coast against the long-anticipated, Allied invasion. Dismayed by the situation he found, the slow building pace, and fearing he had just months before an invasion, Rommel reinvigorated the whole fortification effort along the Atlantic coast. Under his direction, work was significantly sped up, millions of mines laid, and thousands of tank traps and obstacles set up on beaches and throughout the countryside. Rommel, like all other commanders in Wehrmacht, was sure that landings were to occur in Pas-de-Calais. After his battles in Africa, Rommel concluded that any offensive movement would be nearly impossible due to overwhelming Allied air superiority. He argued that the tank forces should be dispersed in small units and kept in heavily fortified positions as close to the front as possible, so they would not have to move far and en masse when the invasion started. He wanted the invasion stopped right on the beaches. However his commander, Gerd von Rundstedt, felt that there was no way to stop the invasion near the beaches due to the equally overwhelming firepower of the Royal Navy. He felt the tanks should be formed into large units well inland near Paris, where they could allow the Allies to extend into France and then cut off the Allied troops. When asked to pick a plan, Hitler vacillated and placed them in the middle, far enough to be useless to Rommel, not far enough to be useful to von Rundstedt. However, during D-Day, several tank units, notably the 12th SS Panzer Division, were close enough to the beaches to create serious havoc. Hitler refused, however, to release the panzer reserves as he believed the Normandy landings were a diversion. Hitler and the German High Command expected the main assault in the Pas de Calais area, thanks to the success of a secret Allied deception campaign (Operation Fortitude). Facing only small-scale, German counter-attacks, the Allies quickly secured a beachhead. On July 17, 1944, Rommel's staff car was strafed by a Royal Canadian Air Force Spitfire and he was hospitalized with major head injuries. In the meantime, following the failed July 20 Plot against Adolf Hitler, a widespread investigation was conducted to identify possible participants in the plot. Rommel's chief of staff, General Hans Speidel, was heavily implicated and Rommel himself was named in some of the ringleaders’ papers as a potential supporter who could be placed in a position of responsibility should their coup succeed. At the same time, local Nazi party officials, during the time Rommel was hospitalized, reported on his extensive and scornful criticism of Nazi incompetent leadership. Bormann was certain of Rommel's involvement, but Goebbels was not. The most serious evidence against him was provided by his own chief of staff, Speidel, who blamed Rommel for his own actions, claiming that he was secretly ordered to support the plot by Rommel. Unfortunately for Rommel, the Court of Military Honor that was to decide the case included two men with whom Rommel had crossed swords before, Heinz Guderian and Gerd von Rundstedt. The Court ruled that there was enough evidence to warrant handing Rommel over to the People's Court. The true extent of Rommel's knowledge of, or involvement with, the plot is still unclear. After the war, however, his wife maintained that Rommel had been against the plot. 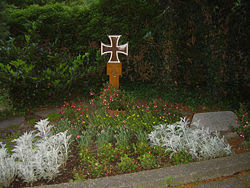 Some believe that he refused to participate because he wanted to avoid giving future generations of Germans the perception that the war was lost because of backstabbing, as was commonly believed by some Germans of World War I.
Erwin Rommel's grave in Herrlingen, 2005. Because of Rommel's popularity with the German people, Hitler gave him the option of committing suicide with cyanide or facing a trial before the People's Court, which could result in the execution of his family and staff. Rommel ended his own life on October, 14, 1944, and was buried with full military honors. After the war, an edited version of his diary was published as The Rommel Papers. He is the only member of the Third Reich establishment to have a museum dedicated to him. His grave can be found in Herrlingen, a short distance west of Ulm. When Rommel's alleged involvement in the plot to kill Hitler became known, his stature was enhanced greatly among the former Allied nations. Rommel was often cited in Western sources as a general who, though a loyal German, was willing to stand up to the evil that was Hitler. The release of the film The Desert Fox: The Story of Rommel (1951) helped enhance his reputation as one of the most widely known and well-regarded leaders in the German Army. "Sweat saves blood, blood saves lives, and brains save both." "Mortal danger is an effective antidote for fixed ideas." Referring to Italians: "Good troops, bad officers. But remember that without them we wouldn't have civilization." "Training errors are recorded on paper. Tactical errors are etched in stone." "I know I haven't offered you much; sand, heat, scorpions … but we've shared them together. One more last push, and it is Cairo. And if we fail, … well, we tried, … together." The Forced Suicide of Field Marshall Rommel, 1944. EyeWitness to History. Excerpts from Rommel's account of the blitzkrieg, 1940. EyeWitness to History. Erwin "The Desert Fox" Rommel. www.findagrave.com. Erwin Rommel Jewish Virtual Library. This page was last modified on 16 August 2017, at 15:08.